As the season continues to move along, there have been some amazing showcases of NBA talent this year. The season is about 50 games in, and we've seen so many top notch performances this year that I wanted to take a moment to discuss 9 of the best this season. I wanted to avoid using the same player more than once, so essentially these are 9 of the best performances from 9 of the best players this season. Let's take a look. -With the Cavs struggling early on in the season, they needed a boost to push them higher. Enter LeBron and his heroics to push them to a winning strategy and get on the right track for the time being. LeBron came ready to play and as a result, he would have one of the greatest games of his career. He was extremely efficient and even made all of his free throws, but most of all, he was fully engaged. 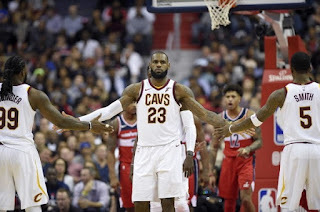 It has become the norm to see Bron coast through the season, so when he came ready to destroy the Wizards, it would result in something epic. Still, the Wizards didn't go down without a fight, but there were no match for a historic night from LeBron. The Cavs would take the victory here and then embark on what is definitely an interesting journey this season. -For all of the talk of the Raptors not being a legit threat in the East, one of the most important things about their success has been the fact that they have a true franchise player in Derozan. He's become a much better player than expected and he seems to improve his game every year, adding the 3 point shot to his arsenal this year. 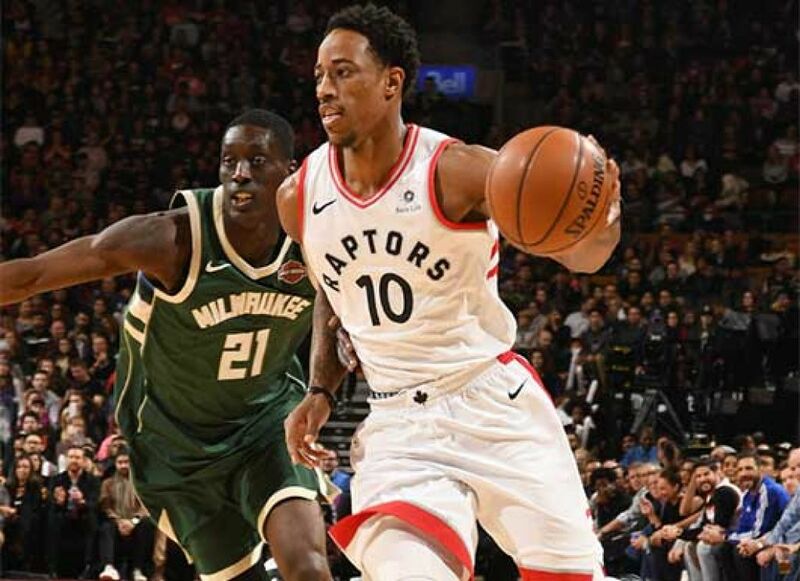 His performance against the Bucks is special, as it took him having a career night for the Raptors to push beyond the Bucks in a thrilling OT game. Derozan was extremely efficient, didn't miss a free throw, and made big plays down the stretch that led to the Raptors walking away victorious. This felt like a statement game from Derozan. 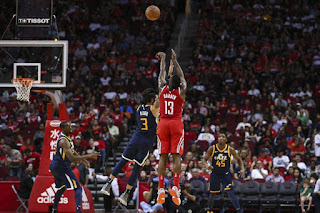 -I am not ashamed to admit that I am not a fan of James Harden and his game. It is damn near unwatchable as a basketball fan, but I'll be honest, every now and then he has an electric performance that shows you what he can be capable of. Two weeks into the season, he would display some of the ability that had him easily at the top of the MVP ladder at the beginning of the season. 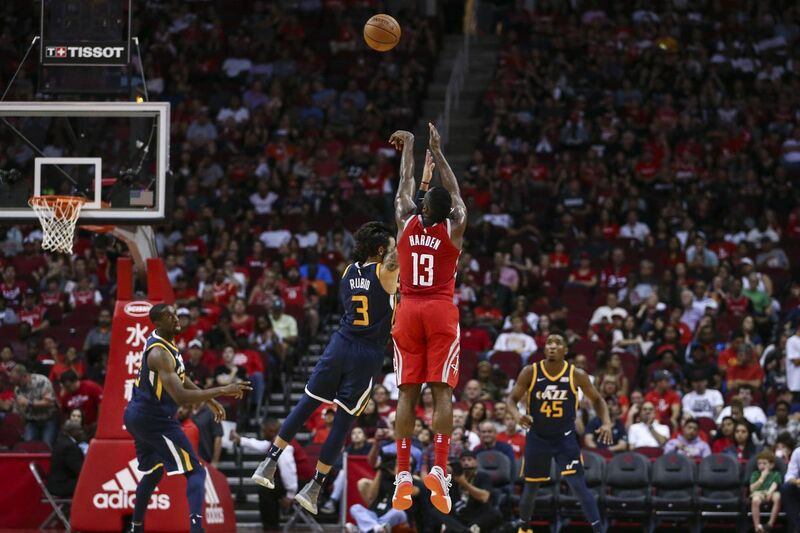 Against a tough Utah Jazz defense, Harden scored at will, finishing his night with 56 points in only 35 minutes. He was likely going to break the Rockets' record, but at that point, it was not to be. Still, this is my favorite performance from Harden this year and it's his best this season. I don't see him duplicating that this season, but you never know. -Considering his season came to an abrupt end, this is slightly bittersweet to discuss. Still, Boogie Cousins is the man. He is one of the best players in the game and easily the best Center in the league. This game was where he showed how dangerous he can be next to Anthony Davis and in reality, he showed that he could lead the team to victory. 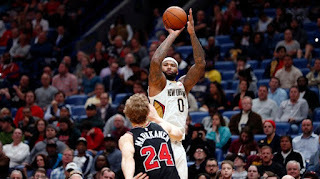 Against a hungry Bulls team, Cousins would register one of the most powerful triple doubles in quite some time, helping the Pelicans steal a hard fought victory once AD fouled out of the game. Simply put, this was Cousins' best performance of the season and it's a shame we won't see him show out like this again until next year. Rest up Boogie. -There are a number of great performances this season from Giannis, but this recent one takes the cake for me. Giannis was unstoppable in a huge blowout win over the Nets and he played minimal minutes compared to his usual output and had one of his best performances thus far. 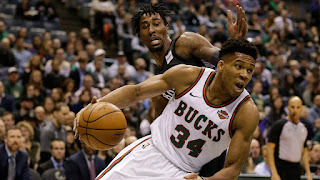 In a season where he's become a MVP candidate at times and showcased his ability to be a dynamic scorer even without a three point shot or sufficient jumper, Giannis has made amazing strides as a player and there is no better example of that than this game, which seemed to be slightly overshadowed by the other games that day. This game deserves more attention. -There is something about playing in the Garden that just turns every top tier player into even more of a beast. This was the moment of the season for Anthony Davis. 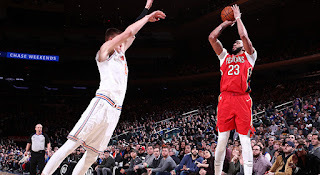 After coming back from a huge deficit against the Knicks, the game came down to a final play in OT, and AD stepped up to deliver. 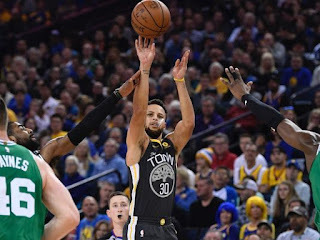 He would hit the game winning shot essentially, but let me be clear: His entire performance this game was superb, as he was quite efficient and made the big plays when needed. Add in his 4 steals and 3 blocks this game, and you have one of the better games of his short but already amazing career. 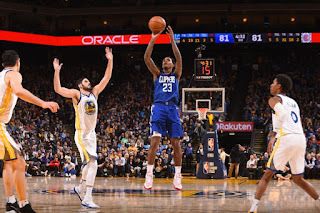 -It isn't often that we see someone come into Oracle Arena and deliver an amazing performance against the best team in the league, but Lou Williams had his career night against the Warriors. On a rare night where the Splash Brothers both weren't playing, Lou Williams was able to abuse the defense and take charge in the second half, ruining Kevin Durant's equally impressive night and his milestone (hitting 20,000 points). Lou Will has been excellent this season and this was his best performance this year by far. Can Lou Will top this performance off the bench this season? I guess we'll have to wait and see. 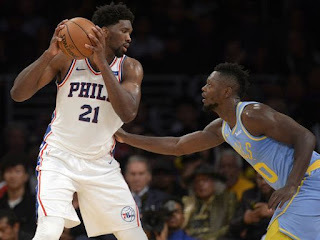 -We finally get to see what a season of Joel Embiid looks like and it's been beyond fun. He's the evolution of the big man in the game, along with Anthony Davis and Demarcus Cousins (one could also give credit to Porzingis and Karl Anthony Towns). He can shoot threes, he is a decent free throw shooter, has the post moves down, and a great midrange shot. So, it should come as no surprise that he put together a dominant performance against a Lakers team that had no answers for him or ideas on how to guard him. Embiid would electrify the Staples Center crowd, finishing his night with 46 points and leading the 76ers a big victory. If the Sixers end up making the playoffs, it will likely be due to the success of Embiid, as he is proving himself to not only be one of the best big men in the league, but he's also an All Star Starter. It'll be fun to see where his career goes from here. -There was a time where I thought that Steph Curry might be the best player in the world. While I recognize LeBron and Kevin Durant as the interchangeable no. 1 and 2, every now and then, Steph puts on a performance that makes me think otherwise. This past Saturday was one of those nights. 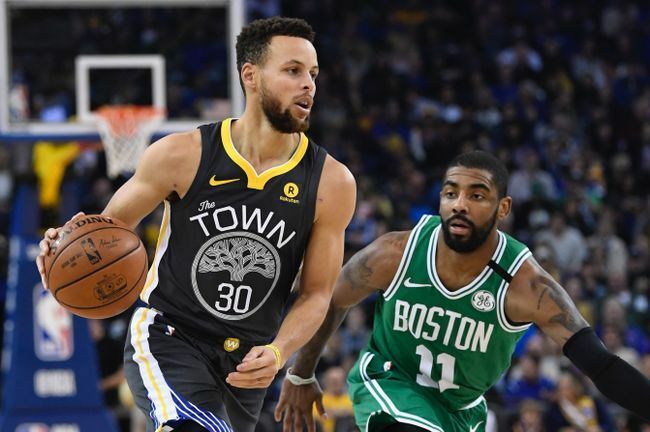 Against the best ranked defense in the NBA, Steph put together one of the greatest performances of his career, doing so on the court with his other All Star teammates Durant and Klay Thompson struggling to find rhythm. In all honesty, since Durant has been in Golden State, this might be the best Steph performance. Steph came up big with game winning shots and free throws to seal the deal. He was on fire all night and honestly, I have to give a mention to Kyrie Irving as well, who was just as good as Steph on this night. Of all the performances on this list, this is my personal favorite and the most entertaining of them all.